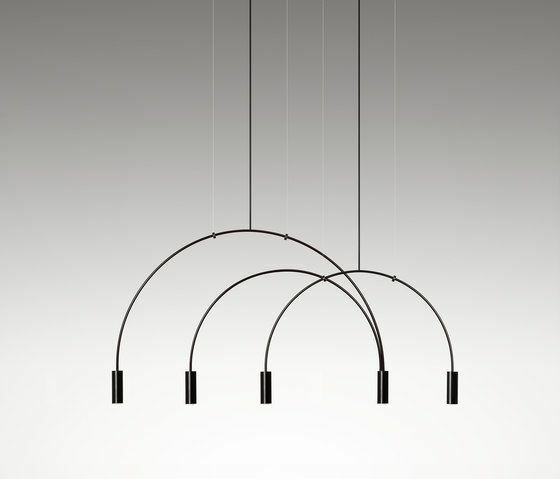 Volta is a family of lights so beautiful they are almost mystical as well as being extremely functional, designed by Nahtrang Studio. Volta is characterised by its sensual and delicate features, by an almost ethereal presence that gives us the impression that the lamps are floating, moved by the force that generates the light. With a half-sphere design suspended from the ceiling or wall, Volta is the perfect lamp for placement on a table or counter, where the various lighting points seek to generate an emotional dialogue through studied and lightweight shapes. Similarly, it is also ideal for workspaces, reading environments, or passageways. Very practical and with an aesthetic feel that is fully adaptable to all types of living rooms, the great versatility of its lines and existing varied designs enables us to create unique settings. With just one piece or through the joint use of several lights, we can generate highly personal spaces, fill living rooms with an infinity of subtle waves and generate infinite atmospheres. And Volta connects points of light, it connects form and space. Estiluz and the green planet. Over forty years have gone by.